Hey Sewists! I am back today with a fun post. Roxanne of PenSeb&Rox just launched a new site and new series called Sew 20. The aim of this new endeavor is to be a strong sewing resource for all of us sewists out there. 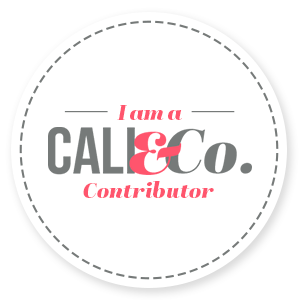 There will be monthly community tours, sewing articles, weekly pattern release round-ups, and so much more! 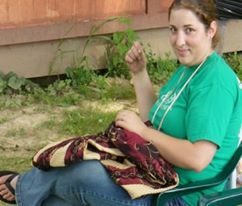 I am so excited to be able to team up with Roxanne for this months community tour: Real Life Sewing. For this theme Roxanne asked us 5 questions about our personal sewing. Here are my responses. Great example of instant gratification! Unique details are the biggest draw for me. I enjoy making my own clothes because I can create one of a kind garments that you are not going to find in the stores. When I find a pattern that has an eye catching detail, I stop to take a closer look at the pattern flats. I determine if the pattern is one that is suitable for my body type. I look at the fabric requirements to make sure it is not a fabric hog pattern and determine what fabrics I have in my stash that will work for it. Quick to sew garments are the next biggest draw. I love a pattern that is quick to sew. If I can cut the pattern and sew it all in one day I am a happy camper. The instant gratification projects are some of the best. I consider it a huge win when I can whip out six pairs of PJ pants in one day. That makes my stashbusting numbers sky rocket. Plus, I love that I can whip up a new dress in an evening if I need something to wear the next day. 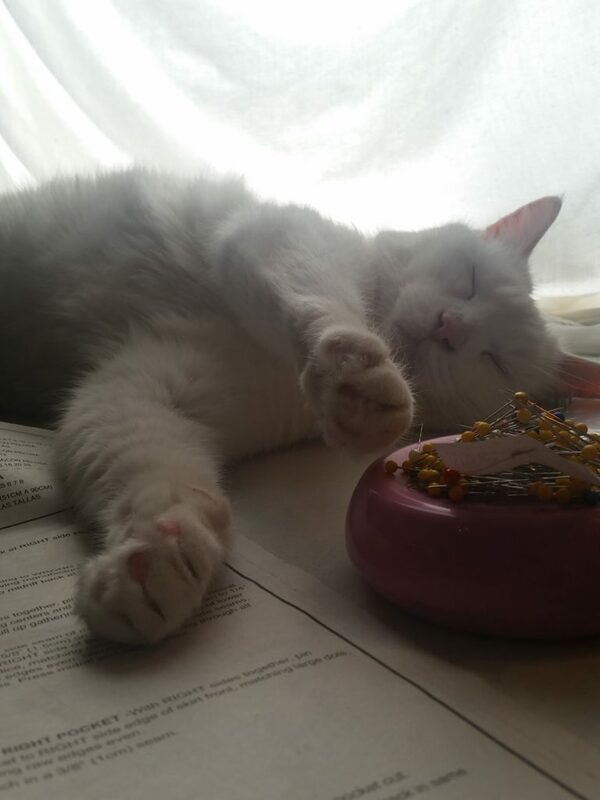 I have a good helper when it comes to procrastinating! I wish I could actually sew all the projects I plan in a more timely fashion. I can easily plan projects, but I am terrible at actually getting them all done. For instance, right now I have had two winter coats planned for over a year, a new renaissance gown planned for the last three years, and several tops and dresses planned for months. I have all the fabrics, notions, and patterns for these projects. I just need the time and motivation. Also, I need to stop being a procrastinator. My most favorite coat, M6442! I wear most all of my makes pretty heavily. In fact, I would say at least 85% of my wardrobe that I wear on a daily basis is me made. Out of that 85%, I think my most worn garment is my plaid coat, M6442. I wear it nearly every day in the winter. It is warm and unique. I pick it over my other coats and it is starting to show wear. 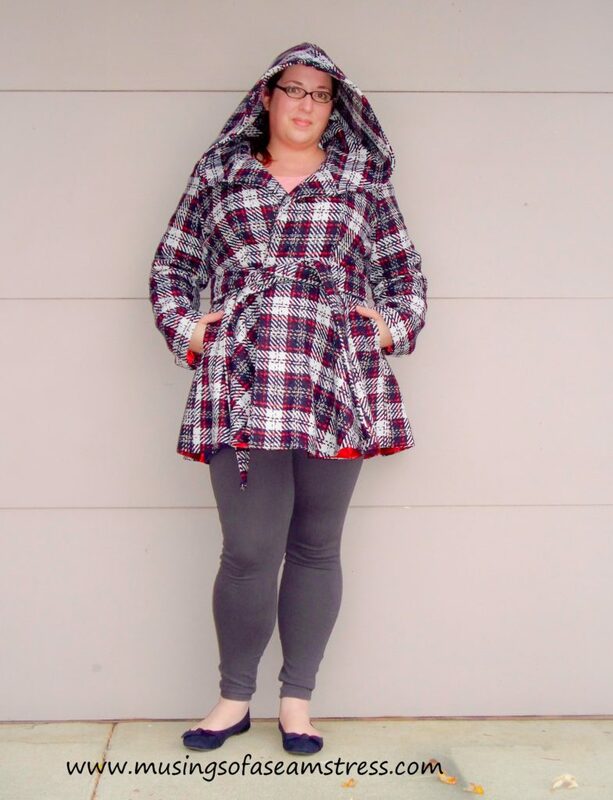 This coat is the reason I have two other winter coats planned out that I really need to make. Sad Simplicity 1355 with peekaboo bra! Sadly, I have a few of these. I thought they seemed like they would be great, but in the end I began to resent them. 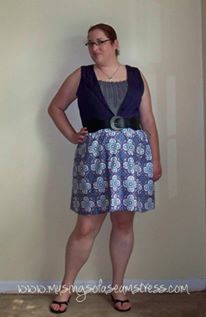 My version of Simplicity 1355 is a great example of that. I thought the envelope art and the garment flat looked great. I picked a scuba print and went to town. Unfortunately, the fabric was a poor choice because scuba is a heavy weight polyester making it unbearably hot to wear. 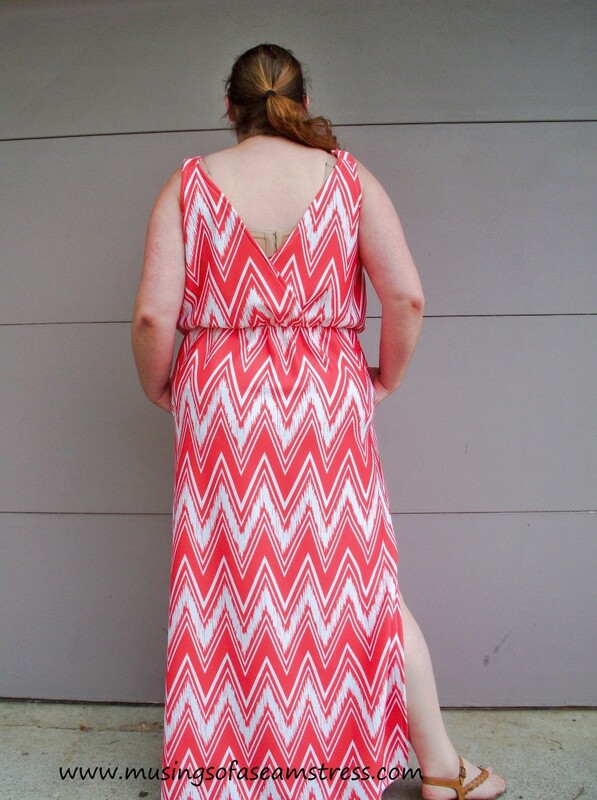 On top of that the pattern cuts really low in the back causing my bra to hang out. I have only worn this dress once since making it last year. I also made a tank top with the scraps of the same fabric. I have yet to wear it or even blog about it. That’s how much I hate this fabric. This quote is actually a song lyric from Macklemore’s 10,000 Hours. This is absolutely one of my favorite songs. Believe it or not I love hip hop. I know, it seems totally out of character, but I do. Truth is, I listen to pretty much everything, hip hop just happens to be my go to preference. Ok, so why is this my favorite, you may be asking? The song 10,000 Hours is referencing Malcom Gladwell’s book Outliers. Which, if you haven’t read you should! It is great! This was 10 years ago! Keep practicing! The whole concept of the book is that it takes 10,000 hours to become a master at anything you do. Gladwell is saying you need to put the time and effort in to anything you want to do before you will get where you want to be. Macklemore’s song is reflecting on his own personal journey to get where he is today. This particular lyric is a reminder to me that the sewists and bloggers I look up to were not at the skill level they are today when they first started. They are there because they put in their 10,000 hours to become a master. They practiced and practiced and didn’t give up. They still keep going even though they may not have thought they could ever reach their current level, because they want to push themselves further. It is a reminder to keep going and keep trying new things. That is how I want my sewing journey to be. I hope you enjoyed my real life sewing journey. Do you have any examples of Real Life, Real Sewing to show off? 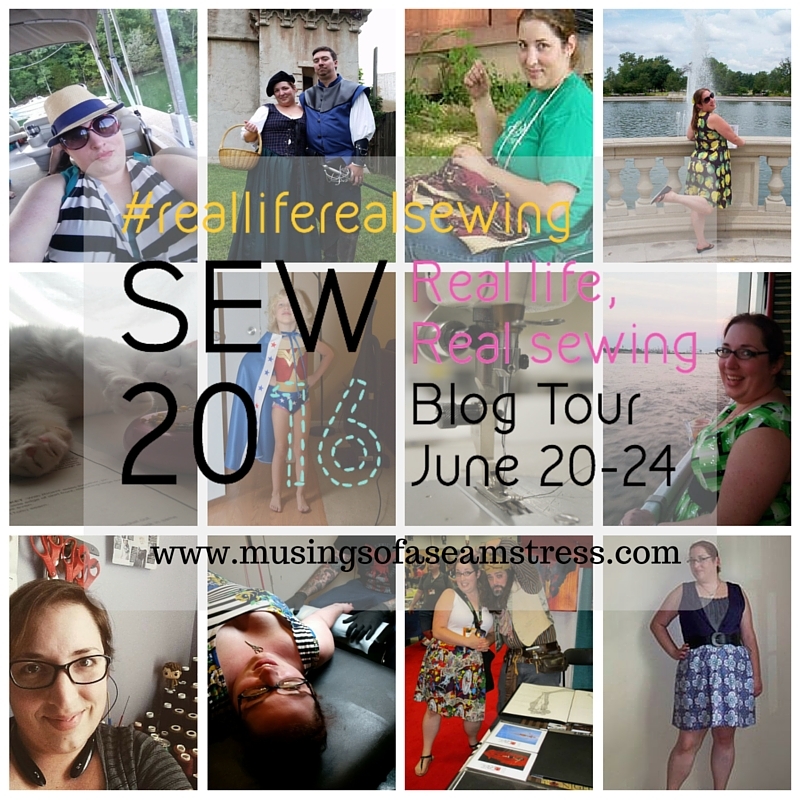 You can play along by using the #realliferealsewing on social media. This entry was posted in Sewing and tagged blog tour, real 20, real life sewing. Bookmark the permalink. I am glad I could introduce you to something new. You will have to let me know what you think about it. I have a pro-cats-inator too. Sometimes when she sits in my lap I have a Pavlovian reponce to jump up and go sew. I wonder how many hours I’ve put in? I think I have a long way to go. Thanks! Definitely put more time into sewing for yourself! It is a huge boost of confidence when I make myself a new outfit. Love your quote! Reminds me of one of my favs “All experts were once beginners!” Such a great read! Thanks! It is a lot like your quote. I think it sums it up perfectly. Yes, future gift! ;)Glad to know I am not the only sewing procrastinator!